●Total volume of game files on my computer. ●The last video game I bought. ●Five video games I play to a lot, or that mean a lot to me. ●Five people to whom I'm passing the baton. 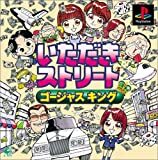 Excerpt: もくず嬢から頂いたゲームバトンでございます。●Total volume of game files on my computer.（コンピュータに入ってるゲームファイルの容量） 1.6GB。結構ある。..